If the thought of spending the night without a hot shower or flushing toilet makes your blood curdle, but you fancy the freedom of wild camping, then you’re in a bit of a quandary. 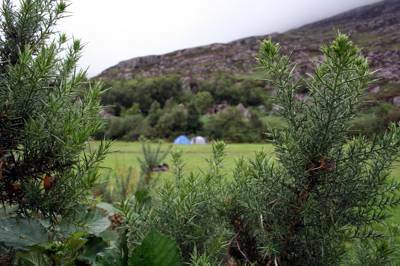 The solution is on hand, though, in the form of the Torridon campsite. Open only to tents and often deserted, this gem is as close to wild camping as you can get, but with toilets and hot showers on hand to ease you through the experience. Despite being located just off the A896 at the entrance to Torridon village and opposite the Torridon Countryside Centre, this small field still manages to feel both incredibly remote and rustic. Rowan trees and Scots pines shield the campsite from the road, and the basic toilet and shower block is actually located just outside the main gate – although they belong to the campsite they are also open to the public. The fact that you are allowed to build campfires – as long as you contain them, use twigs and branches that are lying on the ground and don’t cut any wood from the trees – is also a big plus. 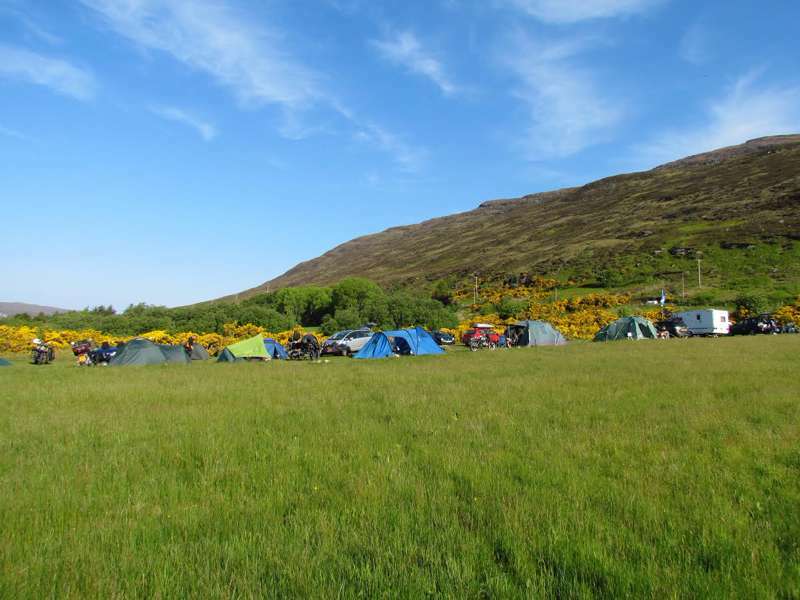 The campsite’s crowning glory, though, is the voluminous Liathach massif that looms large from above the northern perimeter; although Torridon’s volatile weather and frequent low cloud cover mean that you might only see the boulder fields on the mountain’s lower slopes. In keeping with wild camping, you cannot book a pitch in advance and there is no charge to stay at Torridon. In fact, the only drawback you might face is that it can get boggy if it’s been raining, so pitch on the perimeter and park in the Countryside Centre car park. Also, in overcast weather with little wind, the midges can be ferocious, so bring your Avon Skin So Soft repellent. Torridon, a mesmerising, protected landscape of sweeping sea lochs, tumbling burns and hulking mountain peaks that vault towards the heavens, is one of Scotland’s last great wildernesses and a Mecca for walkers and climbers. Together, the Achnashellach and Torridon hills boast no less than 17 Munros. The views from the top of Torridon’s peaks are breathtaking; however, these are serious mountains, where wild weather, knife-edge ridges and vertical ascents make them hazardous for even the most experienced climber, so caution needs to be exercised. It is advisable to tackle more difficult walks in the company of a guide. Low- and high-level walks can be booked with rangers from the Countryside Centre (01445 791368; Easter–September). You can also book a host of outdoor pursuits with Torridon Activities (01445 791242; www.torridon-activities.com), including an excellent navigation course that equips you with the skills to find your way off the mountains in reduced visibility. An alternative is to follow one of the area’s classic lower-level trails to Coire Mhic Fhearchair. It takes around two hours to reach the coire from the A896 car park, but the ascent doesn’t really get steep until you reach the waterfalls that signal your imminent arrival. The centrepiece of this stunning coire is the eponymous Loch Mhic Fhearchair, whose crystal-clear waters reflect the ancient sandstone hulk of the triple buttress that flanks its southern edge. At the end of a strenuous day’s walking amid some of Scotland’s most impressive mountain scenery, you can, as you wash away any aches and pains in a free hot shower and settle down to a meal cooked on your campfire, celebrate your decision not to wild camp. If you can bear to take another short walk or an easy drive, dusk brings hordes of wild stags down to the roadside just to the north. The perfect end to your almost-wild-camping day. Really enjoyed our first wild camping experience at Torridon over the May bank holiday weekend. Site was quiet, felt very remote and the other campers were friendly and considerate. Toilet/showering facilities were well-maintained and very close by. Midges weren't too fierce as the winds kept them at bay (thankfully!!) Would highly recommend and will definitely be back again! Toilets, hot showers and sinks with hot and cold water. The toilet block is located just outside the campsite and can be used by the general public too. The only shelter other than your tent is the public toilet, so put on your waterproofs and prepare to brave the elements, but stick to low-level walks. Or chill out at the Torridon Inn, which also has rooms. The Torridon Inn (01445 791242; formerly the Ben Damph Inn) lies 3 miles from the campsite (on the A896 towards Shieldaig) in a former stable block and has a welcoming bar and restaurant with upmarket pub grub (£10–12 for a main), a good selection of real ales and, of course, plenty of whiskies. The bar was once in the Guinness Book of Records for its malt selection. Now it has just 60 to choose from. There is no charge and bookings are not taken. Heading north on the A9 from Inverness take the A835 towards Ullapool then the A832 towards Gairloch. After Kinlochewe turn left on to the A896 (signposted to Shieldaig) and look out for the right turn to Torridon. The campsite is on the right. There are bus services from Strathcarron to Torridon via Shieldaig, and from Lochcarron via Kishorn (see www.stagecoachbus.com for timetables).